to be used in the Magnetic Attraction "Body Strap". Also can be used in the washing machine instead of using detergents! These magnets have a penetration of up to 17cm into soft tissue and are a permanent magnet. ie: they will never lose their energy. 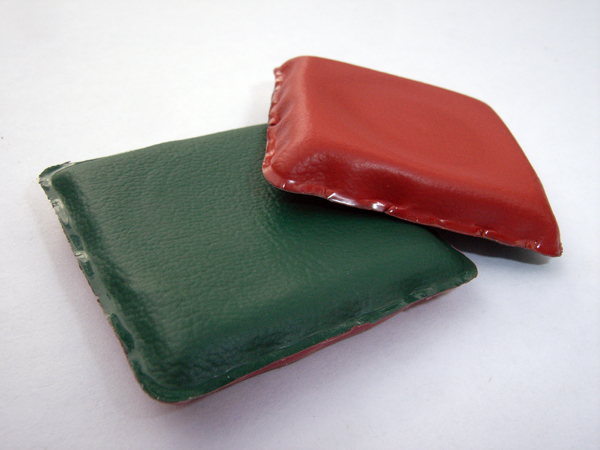 These powerful Rare Earth Magnets are encased in Foam Rubber to form the correct size and shape to be inserted into the Magnetic Attraction "Body Strap" and have been colour coded with Red and Green, and completely sealed with vinyl. GREEN = NORTH (Alkaline) energy is a soothing, cooling, calming energy. It acts as a natural antibiotic and assists in balancing the pH level of the body. This is the side of the magnet which is recommended to sooth or relieve discomfort. All illness stems from the same root cause....too much tissue acid waste in the body. Viruses, fungi, bacteria and disease can only survive in an acid environment. It is therefore suggested that you use the magnet with the NORTH (Green) side facing your body. RED = SOUTH (Acidic) energy is a warming, activating, energy. It can assist in promoting growth and can speed up the healing process of broken bones, scarr tissue etc. I t may be used to increase energy but should be used sparingly as it can create more acidity. These magnets must be ordered separately with your Magnetic Attraction "Body Strap":. This smaller magnet (12mm x 5mm) is suggested for children or people who are slight in build. Eg: If you have a small wrist, place one in the pocket on the top of your wrist and the other on the bottom. If you have an average to larger wrist, ankle etc, it is recommended that you purchase the 25mm x 5mm Rare Earth Magnet. (this magnet is the one used in the Magnetic Attraction "Duo Water Block". Should you be ordering a Red or Green knee strap and your pain in severe, you may wish to use 2 of the 25 x 5mm magnets and place them on opposite sides of the knee, creating a magnetic tunnel effect. Click the button below to add the Rare Earth Magnet 25x5mm Vinyl Sealed to your wish list.